Showing results for "rolly toys jcb tractor with loader and excavator"
Realistically styled extra large JCB licensed pedal tractor ride on with frontloader and a working rear excavator. The Rolly Junior range is recommended for the height range 104cm - 152cm. Opening bonnet. Adjustable seat. Size H76, W53, D164.5cm. Weight 13kg. Maximum user weight 50kg. Self-assembly. For ages 3 years and over. WARNING(S): Not suitable for children under 3 years old. Only for domestic use. To be used under the direct supervision of an adult. eBay Rolly Toys JCB Tractor with Loader and Excavator Ride On. Realistically styled large JCB licensed pedal tractor ride on with detachable trailer. The Rolly kid tractor is recommended for children in the height range 92cm - 128cm. Roll bar. Opening bonnet. Size H52, W47, D134cm. Weight 8kg. Maximum user weight 50kg. Self-assembly. For ages 3 years and over. WARNING(S): Only for domestic use. To be used under the direct supervision of an adult. Argos.co.uk Rolly Toys Rear Excavator for Rolly Tractors - Red. The Rolly Toys rear excavator fits all Rolly tractors (except Minitracs). It can only be used when stationary with support leg down, the seat and arm can turn through 180 degrees, the control levers allow it to raise and lower the scoop and tip material just like the real thing. Easy grip handles. Size H78, W23, D40cm. Weight 1.8kg. Maximum user weight 50kg. Self-assembly. For ages 30 months and over. WARNING(S): Only for domestic use. To be used under the direct supervision of an adult. Argos.co.uk Rolly Toys Rear Excavator John Deere for Rolly Tractors. The John Deere rear excavator fits all Rolly tractors (excpet Minitracs). It can only be used when stationary with support leg down, the seat and arm can turn around 180 degrees, the control levers allow it to raise and lower the scoop and tip material just like the real thing. Easy grip handles. Size H78, W23, D40cm. Weight 1.8kg. Maximum user weight 50kg. Self-assembly. For ages 30 months and over. WARNING(S): Only for domestic use. To be used under the direct supervision of an adult. This large John Deere junior tractor ride on has an adjustable seat, anti-slip pedals, all terrain wheels, front hitch pin, opening bonnet and a large front loader that can be released, scooped and tipped. The rear excavator has its own seat, imitation hydraulic foot and two levers that operate the excavating bucket - which imitates exactly the action of a real excavator. The tractor can also be ridden with the rear excavator tucked back in its inoperative position. Long back support. Wide wheels. Size H76, W53, D164.5cm. Weight 13kg. Maximum user weight 50kg. Self-assembly. For ages 3 years and over. WARNING(S): Only for domestic use. To be used under the direct supervision of an adult. 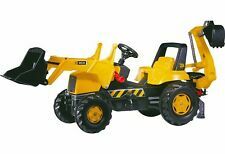 Argos.co.uk Rolly Toys JCB Dumper. Realistically styled large JCB licensed dumper truck with tipping dumper. The Rolly kid tractor is recommended for children in the height range 92cm - 128cm. Anti slip pedals. Large rugged wheels. Size H52, W44, D93cm. Weight 6.6kg. Maximum user weight 50kg. Self-assembly. For ages 3 years and over. WARNING(S): Only for domestic use. To be used under the direct supervision of an adult. This extra large Caterpillar licensed pedal tractor ride on has a working front loader and rear excavator and the bonnet opens too. This great vehicle will stretch your childs imagination to the limit. Adjustable seat with backrest. The Rolly Junior range is recommended for the height range 104cm - 152cm. Size H76, W53, D164.5cm. Weight 13kg. Maximum user weight 50kg. Minimal assembly. For ages 3 years and over. WARNING(S): Not suitable for children under 3 years old. Only for domestic use. To be used under the direct supervision of an adult. This great JCB pedal operated tractor ride on features a working front loader, an opening bonnet, large rugged wheels and front and rear hitch pins for attaching all the accessories a busy worker will need; Adjustable seat with backrest. The Rolly farm trac range is recommended for the height range 104cm - 152cm. Size H81, W53, D142cm. Weight 12.6kg. Maximum user weight 50kg. Minimal assembly. For ages 3 years and over. WARNING(S): Not suitable for children under 3 years old. Only for domestic use. To be used under the direct supervision of an adult. Argos.co.uk Rolly Toys Tractor Frontloader Kit. Add extra play value to any large Rolly tractor with this Rolly Trac Frontloader Kit. Only suitable for large Rolly Tractors. Easy grip handles. Size H40, W35, D83cm. Weight 2.7kg. Self-assembly. For ages 3 years and over. WARNING(S): Not suitable for children under 3 years old. Only for domestic use. To be used under the direct supervision of an adult. Easily converts the front loader of a large Rolly tractor into a grabber. Not suitable for the Rolly Mini Trac, Rolly Junior or Rolly Kid ranges. Easy grip handles. Size H30, W35, D42cm. Weight 1kg. Self-assembly. For ages 3 years and over. WARNING(S): Not suitable for children under 3 years old. Only for domestic use. To be used under the direct supervision of an adult. Realistically styled large Caterpillar licensed pedal tractor ride on with a working frontloader and a detachable trailer. The Rolly kid tractor is recommended for children in the height range 92cm - 128cm. Opening bonnet. Size H55, W47, D161cm. Weight 9.2kg. Maximum user weight 50kg. Self-assembly. For ages 3 years and over. WARNING(S): Only for domestic use. To be used under the direct supervision of an adult. Realistically styled large Case licensed pedal tractor ride on with detachable trailer. The Rolly kid tractor is recommended for children in the height range 92cm - 128cm. Roll bar. Opening bonnet. Size H52, W47, D134cm. Weight 8kg. Maximum user weight 50kg. Self-assembly. For ages 3 years and over. WARNING(S): Only for domestic use. To be used under the direct supervision of an adult. Argos.co.uk Rolly Toys Frontloader Kit for Rolly Junior Tractors. Add extra play value to any Rolly Junior Tractor with this Rolly Frontloader Kit which can tip and scoop. Easy grip handles. Size H33, W37, D81cm. Weight 2kg. Self-assembly. For ages 3 years and over. WARNING(S): Not suitable for children under 3 years old. Only for domestic use. To be used under the direct supervision of an adult. Argos.co.uk Rolly Toys Frontloader Kit for Rolly Kids Tractors. Add extra play value to any Rolly Kid Tractor with this Rolly Kid Frontloader Kit which can tip and scoop. Easy grip handles. Size H33, W37, D81cm. Weight 2.1kg. Self-assembly. For ages 30 months and over. WARNING(S): Only for domestic use. To be used under the direct supervision of an adult. This large green chain driven tractor ride on features rugged style wheels, anti-slip pedals, opening bonnet, rear hitch pin and is completed by a large detachable trailer. Wide wheels. Size H52, W47, D134cm. Weight 7.8kg. Maximum user weight 50kg. Self-assembly. Suitable from birth. For ages 30 months and over. WARNING(S): Only for domestic use. To be used under the direct supervision of an adult. Realistically styled large New Holland licensed pedal tractor ride on with detachable trailer and a working frontloader. The Rolly kid tractor is recommended for children in the height range 92cm - 128cm. Opening bonnet. Size H55, W47, D161cm. Weight 9.2kg. Maximum user weight 50kg. Self-assembly. For ages 3 years and over. WARNING(S): Only for domestic use. To be used under the direct supervision of an adult. Realistically styled large New Holland licensed pedal tractor ride on with detachable trailer. The Rolly kid tractor is recommended for children in the height range 92cm - 128cm. Anti slip pedals. Opening bonnet. Size H52, W47, D134cm. Weight 7.8kg. Maximum user weight 50kg. Self-assembly. For ages 3 years and over. WARNING(S): Only for domestic use. To be used under the direct supervision of an adult. This New Holland Construction licensed tractor ride on has an opening bonnet, adjustable seat, anti-slip pedals, all terrain wheels, front hitch pin and a large front loader that can be released, scooped and tipped. The rear excavator has its own seat, imitation hydraulic foot and two levers that operate the excavating bucket, which imitates the action of a real New Holland Construction excavator. The tractor can be ridden with the rear excavator tuicked back in its inoperative position. Long back support. Wide wheels. Easy grip handles. Size H76, W53, D164.5cm. Weight 13kg. Maximum user weight 50kg. Self-assembly. For ages 3 years and over. WARNING(S): Not suitable for children under 3 years old. Only for domestic use. To be used under the direct supervision of an adult. This extra large red chain driven tractor ride on has an adjustable seat with back rest, an opening bonnet, anti-slip pedals, front and rear hitch pins, chunky steering wheel and large rugged wheels. Long back support. Wide wheels. Size H62, W53, D100cm. Weight 9.2kg. Maximum user weight 50kg. Self-assembly. For ages 3 years and over. WARNING(S): Not suitable for children under 3 years old. Only for domestic use. To be used under the direct supervision of an adult. Realistically styled large Massey Ferguson licensed pedal tractor ride on with detachable trailer. The Rolly kid tractor is recommended for children in the height range 92cm - 128cm. Anti slip pedals. Opening Bonnet. Size H52, W47, D134cm. Weight 7.8kg. Maximum user weight 50kg. Self-assembly. For ages 3 years and over. WARNING(S): Only for domestic use. To be used under the direct supervision of an adult. This is the largest John Deere licensed pedal tractor ride on currently available in Europe. It has a working front loader and the bonnet opens. Because of its size, it can be enjoyed by children of up to 10 years old. This would make a great present and would captivate your child for years and years to come. Adjustable seat with backrest. Front and rear hitch pins, for attaching accessories. The Rolly large tractor is recommended for the height range 110cm - 164cm. Size H83, W57, D154cm. Weight 15.2kg. Maximum user weight 100kg. Minimal assembly. For ages 3 years and over. WARNING(S): Not suitable for children under 3 years old. Only for domestic use. To be used under the direct supervision of an adult. This large red Zetor chain driven tractor ride on has a rear hitch pin, anti-slip pedals, an opening bonnet and rugged style wheels. Wide wheels. Size H52, W44, D82cm. Weight 6.1kg. Maximum user weight 50kg. Self-assembly. For ages 30 months and over. WARNING(S): Only for domestic use. To be used under the direct supervision of an adult. Argos.co.uk JCB 3CX Backhoe Loader. The JCB 3CX Backhoe Loader with enclosed cab, interior and decal detail, front wheel steering and rolling wheels with tyre tread detail. The Backhoe arm swivels 180 and slides along rear rail. This model is compatible with other items in the Britains range. Figures not included. For ages 3 years and over. WARNING(S): Not suitable for children under 3 years old. Only for domestic use. This great JCB pedal operated tractor ride on features an opening bonnet, large rugged wheels and front and rear hitch pins for attaching all the accessories a busy worker will need; Adjustable seat with backrest. The Rolly farm trac range is recommended for the height range 104cm - 152cm. Size H60, W53, D106cm. Weight 9.3kg. Maximum user weight 50kg. Minimal assembly. For ages 3 years and over. WARNING(S): Not suitable for children under 3 years old. Only for domestic use. To be used under the direct supervision of an adult. Argos.co.uk Rolly Toys New Holland Construction 360 Degree Excavator. This giant sit on New Holland Construction excavator is easily transportable. It features 4 large wheels and has a 360 degrees turning circle with a digger mechanism just like the real thing. It has a locking arm device and can be used on earth or sand. Wide wheels. Easy grip handles. Size H74, W43, D102cm. Weight 4.1kg. Maximum user weight 50kg. Self-assembly. For ages 3 years and over. WARNING(S): Not suitable for children under 3 years old. Only for domestic use. To be used under the direct supervision of an adult. Argos.co.uk Rolly Toys Caterpillar Dumper. Realistically styled Caterpillar licensed dumper truck with tipping front dumper. The Rolly kid tractor is recommended for children in the height range 92cm - 128cm. Anti slip pedals. Large rugged wheels. Size H52, W47, D134cm. Weight 8kg. Maximum user weight 50kg. Self-assembly. For ages 3 years and over. WARNING(S): Only for domestic use. To be used under the direct supervision of an adult. Realistically styled extra large tractor ride on with a working frontloader and an extra large detachable farm trailer. The Rolly Junior range is recommended for the height range 104cm - 152cm. Opening bonnet. Roll bar. Adjustable seat. Size H62, W53, D162cm. Weight 13.6kg. Maximum user weight 50kg. Self-assembly. For ages 3 years and over. WARNING(S): Not suitable for children under 3 years old. Only for domestic use. To be used under the direct supervision of an adult. This John Deere trailer is designed solely to fit the Rolly Mini Trac range. It features a heavy duty tipping load space which links to the back of any Rolly Mini Trac tractor by a coupling pin through its draw bar eye. Size H34, W30, D25cm. Weight 1.8kg. Self-assembly. For ages 18 months and over. WARNING(S): Only for domestic use. To be used under the direct supervision of an adult. This large chain driven red tractor ride on has anti-slip pedals, opening bonnet, rear hitch pin, rugged styled wheels, a front loader that can be released, tipped and scooped and is completed by a large detachable trailer. Wide wheels. Size H55, W47, D161cm. Weight 9.2kg. Maximum user weight 50kg. Self-assembly. For ages 3 years and over. WARNING(S): Only for domestic use. To be used under the direct supervision of an adult. Argos.co.uk Rolly Toys Case CVX 1170 Mini Trac with Opening Bonnet. This Case CVX 1170 foot to floor ride on tractor features an opening bonnet, a large steering wheel with an integral squeaky horn and a knee indentation to scoop along. Case licensed foot to floor tractor. Large rugged wheels. Wide wheels. Size H41, W30, D61cm. Weight 4.2kg. Maximum user weight 50kg. Self-assembly. For ages 18 months and over. WARNING(S): Only for domestic use. To be used under the direct supervision of an adult. This JCB tracked excavator model features 360 rotating cab, long reach hydralic arm, working rubber tracks and an interchangeable bucket. This is an authentic 1:32 scale model replica, constructed from die cast metal and plastic. Figures not included. For ages 3 years and over. WARNING(S): Not suitable for children under 3 years old. Only for domestic use. Argos.co.uk Rolly Toys Pump & Spray Gun for Rolly Tankers. With a pump action spray, this is a pefect addition to any Rolly Tanker. Simply take the filler cap off the tanker and insert the Pump & Spray Gun and start pumping to create a spray. Easy grip handles. Size H10, W10, D30cm. Weight 0.3kg. Self-assembly. For ages 3 years and over. WARNING(S): Not suitable for children under 3 years old. Only for domestic use. To be used under the direct supervision of an adult. This large red chain driven tractor ride on features anti-slip pedals, an opening bonnet, rear hitch pin, rugged styled wheels and is completed by a large detachable trailer. Wide wheels. Size H52, W47, D134cm. Weight 7.8kg. Maximum user weight 50kg. Self-assembly. For ages 3 years and over. WARNING(S): Only for domestic use. To be used under the direct supervision of an adult. Argos.co.uk Rolly Toys Massey Ferguson 5470 Mini Trac w/ Opening Bonnet. This Massey Ferguson 5470 foot to floor ride on tractor features an opening bonnet, a steering wheel with an integral squeaky horn and a knee indentation to scoot along. Wide wheels. Size H41, W30, D61cm. Weight 4.2kg. Maximum user weight 50kg. Self-assembly. For ages 18 months and over. WARNING(S): Only for domestic use. To be used under the direct supervision of an adult. A fully functional sweeper with rotating roller brush. Unsuitable for the Rolly Kid and Minitrac Ranges. Easy grip handles. Size H40, W49, D44cm. Weight 3.1kg. Self-assembly. For ages 3 years and over. WARNING(S): Not suitable for children under 3 years old. Only for domestic use. To be used under the direct supervision of an adult. This New Holland pedal tractor ride on is just like the ones you see in the field; It has large rugged wheels and hitch pins on the front and back to store all those accessories you will need for a busy day out in the field. Adjustable seat with backrest. The Rolly large tractor is recommended for the height range 110cm - 164cm. Size H60, W51, D112cm. Weight 9.7kg. Maximum user weight 50kg. Minimal assembly. For ages 3 years and over. WARNING(S): Not suitable for children under 3 years old. Only for domestic use. To be used under the direct supervision of an adult. Argos.co.uk Rolly Toys Sweepy for Rolly Tractors - Green/Yellow.